When I was in school, teachers would periodically pass out newsprint fliers from Scholastic, highlighting a number of their books. Many of us would go through and circled all the cool-looking stuff we'd like, then beg Mom for enough money to order the books. We'd dutifully tromp back to school to deliver a pile of change and our poorly written order forms to the teacher. She (all of my teachers back then were female) filed the orders and, what seemed like an eternity later, would eventually pass out whatever books we had ordered. For whatever reason(s), this practice didn't survive in my district past grade school, but I noticed today that Scholastic still continues with the procedure. I was browsing through their current offerings for 2nd-3rd graders and, after a cursory scan, I had the idea to see if I could channel my 8-year-old self and figure out what he'd like to get. The first thing that pops out is Star Wars The Clone Wars: Tethan Battle Adventure. Back then, I was all about Star Wars, not surprisingly and picked up everything I could get my hands on. Which, you might recall, was quite a fair bit less than what's available today! At the time, I wasn't a big fantasy fan (my gaming days were still ahead of me) but I did like a lot of the old monster movies I saw on Saturday afternoon TV. I recall having more than a couple books about monsters -- mostly werewolves, vampires, mummies and Frankenstein-style creations but there was some overlap into ancient Greek legends (minotaurs, hydra, etc.) and cryptozoology (Sasquatch, Loch Ness Monster, etc.). So Beast Quest: Tagus the Night Horse and An Awfully Beastly Business: Werewolf vs. Dragon probably would've stood out a bit. I'm not sure if these would have been at the top of my list, but they certainly would've caught my eye. But a monster book that probably would've elicited a little more attention is Ursula Vernon's Dragonbreath. To which, I suspect, most readers of this blog will respond with a confused, "Wha-huh?" 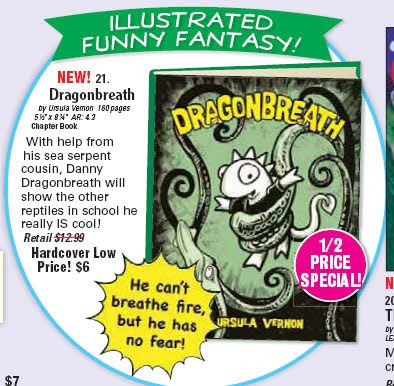 According to Vernon's own site, Dragonbreath is a "combination of text and graphic novel" that relay "the adventures of Danny Dragon, a young dragon attending a school for reptiles and amphibians. Join Danny and his best friend Wendell the Iguana as they travel under the sea outwitting bullies, fending off giant squid, meet giant heron, run from ninjas,and fight were-hotdogs, all the while trying to avoid getting an F in Science!" ... which I think would've captured my younger self's interest. This harkens back to my post from about a month ago talking about kids' and young adult comics. Vernon's actually just come out with a second Dragonbreath book and I'll have to cite my own failings for missing that entirely before now. But it's curious to note that, after spending most of my comics background looking at what are stereotypically considering adolescent books, I now find I'm drawn more towards books aimed at a decidedly younger audience. Oh man, the Scholastic flyers. Those were AWESOME. At least for those of us who liked to read, I suppose. If one did, it was like a little year-round version of the Sears Wishbook (if anyone remembers THAT).